B-1 and B-2 B cells derive from distinct progenitors that emerge in overlapping waves of development. The number of murine B-1 progenitors peaks during fetal development whereas B-2 B cell production predominates in adult bone marrow. Many genetic mutations that underlie B-acute lymphoblastic leukemia (B-ALL) occur in the fetus, at which time B-1 progenitor numbers are high. However, whether B-ALL can initiate in B-1 progenitors is unknown. In the present study, we report that BCR-ABL–transformed murine B-1 progenitors can be B-ALL cells of origin and demonstrate that they initiate disease more rapidly than do oncogene-expressing B-2 progenitors. We further demonstrate that B-1 progenitors exhibit relative resistance to apoptosis and undergo significant growth following oncogene expression, and we propose that these properties underlie the accelerated kinetics with which they initiate leukemia. These results provide a developmental perspective on the origin of B-ALL and indicate B cell lineage as a factor influencing disease progression. B cell development initiates during embryogenesis (1, 2). However, rather than being a linear process in which all types of B cells are generated, at least two distinct waves of fetal B lymphopoiesis have been defined (3). During the first, B-1 progenitors are generated. These cells ultimately mature into innate-like B-1a and B-1b cells that provide defense against pathogens that include encapsulated bacteria (4, 5). Subsequently, B-2 B cell progenitors arise, and they are the predominant B cell progenitor population present in postnatal bone marrow (6). Most B lymphocytes in peripheral immune tissues are B-2 B cells, which are involved in adaptive immune responses (7). In addition to differences in the kinetics with which they appear during embryogenesis, B-1 and B-2 progenitors can be distinguished by their cytokine responsiveness. For example, B-1 progenitors proliferate more vigorously to IL-7 than do B-2 progenitors (8). Additionally, B-1, but not B-2, progenitors can be distinguished based on their ability to respond to thymic stromal lymphopoietin (TSLP) (6, 9). It was initially proposed that TSLP had no effect on adult pro-B cells and its actions were limited to B cell progenitors in fetal tissues (10). However, we subsequently demonstrated that B cell lineage defined TSLP responsiveness. Thus, B-1 progenitors from fetal liver and young adult bone marrow responded to TSLP whereas B-2 progenitors, regardless of whether they were isolated from fetal or adult tissues, could not do so (6). Taken together with the differences in the kinetics with which they arise, these observations demonstrate that B-1 and B-2 progenitors exhibit distinct properties. B-acute lymphoblastic leukemia (B-ALL) is the most common pediatric malignancy (11, 12). Although up to 80% of B-ALL patients respond well to treatment and survive long-term, the remaining 20% often have a poor prognosis (13). Various chromosomal translocations, such as ETV6-RUNX1 (TEL-AML1), MLL-AF4, and BCR-ABL, frequently underlie B-ALL and have been used to stratify patients into risk groups predictive of survival or therapeutic response (11, 14). For example, children with the BCR-ABL translocation, which encodes the Philadelphia chromosome, are classified as high risk based on elevated leukocyte counts at diagnosis, CNS involvement, and poor response to treatment (15–18). Many of these chromosomal translocations occur in the human fetus (19, 20). Interestingly, this is the time that murine B-1 progenitor numbers peak (3). If human B-1 progenitor numbers are at their maximum at this time as well, then some infant and pediatric B-ALL cases could be B-1 malignancies. However, whether B-ALL can arise in B-1 progenitors has not been tested. We now report that B-1 progenitors can be ALL cells of origin and demonstrate that BCR-ABL–transduced B-1 progenitors initiate disease more rapidly than do oncogene-expressing B-2 progenitors. We further propose, based on in vitro modeling of ALL, that the high proliferative potential and relative resistance to oncogene-induced apoptosis of B-1 progenitors underlie the accelerated kinetics with which they initiate leukemia. Taken together, these results further define differences between the B-1 and B-2 lineages and provide a novel developmental perspective on the origins of pediatric ALL. Swiss Webster (SW), CB17.SCID, and RAG-2/SJL (RAG, B6.SJL(129S6)-Ptprca/BoCrTac-Rag2tm1) mice were obtained from Taconic Farms (Germantown, NY). TSLP receptor–deficient (CRLF2−/−) mice were a gift of Dr. James Ihle at St. Jude Children’s Research Hospital (21). C57BL/6 (B6) and IL-7Rα−/− (B6.129S7-Il7rtm1Imx/J) mice were purchased from The Jackson Laboratory (Bar Harbor, ME). In initial experiments B cell progenitors were harvested from SW fetal liver at embryonic day 15. Otherwise, progenitors were purified from 4- to 6-wk-old SW, B6, and CRLF2−/− mice and 1.5- to 3-wk-old IL-7Rα−/− mice. All animals were housed and/or bred in the vivarium of the Division of Laboratory Animal Medicine, University of California at Los Angeles. Animal care and use were conducted according to the guidelines of the Institutional Animal Care and Use Committee. Cell suspensions from spleen were prepared by crushing tissue between frosted slides in Ca2+ Mg2+-free PBS. Bone marrow cell suspensions were prepared by flushing bones with Ca2+ Mg2+-free PBS. When necessary, RBCs were lysed with ACK buffer. All samples were incubated with anti-CD16/CD32 (FcγRII-III; clone 2.4G2) to block nonspecific labeling. Optimum working dilutions for the following Abs were determined before use: CD19 (clone 1D3), CD45R (B220, clone RA3-6B2), CD93 (AA4.1, clone C1qRp), and CD43 (clone S7). Mature lineage (Lin) cells were detected with an Ab mixture that included goat anti-mouse IgM, anti-CD3ε (clone 145-2C11), CD8α (clone 53-6.7), TCRβ (clone H57-597), TCRγδ (clone UC7-13D5), NK1.1 (clone PK136), Ly-6C (clone AL-21), CD11b (clone M1/70), Ter-119 (clone Ter-119), and Gr-1 (clone RB6-8C5). Anti-IgM was obtained from SouthernBiotech (Birmingham, AL) and other Abs were purchased from eBioscience (San Diego, CA). Cells were stained for 30 min at 4°C, washed with Ca2 Mg2+-free PBS, and analyzed on an LSR II (BD Biosciences). B-1 progenitors, defined as Lin−CD19+CD45R (B220)−/lowCD93+ and B-2 progenitors, defined as Lin−CD19−CD45R (B220)+CD93+CD43+, were isolated on a FACSAria (BD Biosciences, San Jose, CA). In some experiments, GFP expression was used to sort transduced cells following culture or B-ALL tumor cells from the spleen of diseased recipients. The frequency of GFP+annexinV+/high and propidium iodide (PI)+ cells was determined by staining cells with a PE annexin V apoptosis kit (BD Pharmingen, San Diego, CA) according to the manufacturer’s instructions and analyzing them on an LSR II. BCR-ABL–expressing (i.e., GFP+) B-ALL cells were isolated from the spleen of diseased animals on a FACSAria and tested for their levels of activated Stat5 as follows. Cells were fixed with 0.5% methanol-free formaldehyde for 10 min at 4°C, washed with Ca2+ Mg2+-free PBS, and permeabilized with 70% ice-cold methanol in a dropwise manner and constant agitation. After washing, the cells were incubated for 30 min with anti-CD16/CD32 (FcgRII-III, clone 2.4G2) as a blocking agent and Pacific Blue–labeled mouse anti-Stat5 (clone 47/Stat5(pY609)) or mouse IgG1κ isotype control (clone MOPC-21) (all from BD Biosciences). The frequency of GFP+ cells that expressed Stat5 was then determined on an LSR II. BCR-ABL–expressing (i.e., GFP+) B-ALL cells were isolated from the spleen of diseased animals on a FACSAria, fixed and permeabilized with BD Cytofix/Cytoperm and permeabilization solution, and washed with 1× BD Perm/Wash buffer as per the manufacturer’s instructions. The cells were then incubated for 30 min with anti-CD16/CD32 (FcγRII-III, clone 2.4G2; eBioscience) as a blocking agent before adding PE-mouse anti–Ki-67 or PE-mouse IgG1 isotype control (Becton Dickinson) for 30 min. The cells were then washed with 1× BD Perm/Wash buffer and analyzed on an LSR II (Becton Dickinson) located in the Broad Stem Cell Research Center at the University of California at Los Angeles. pMSCV40 retroviral vectors containing either a 5′ LTR-driven p210 BCR-ABL internal ribosome entry site–enhanced GFP (EGFP; BCR-ABL/GFP) or a 5′ LTR-driven internal ribosome entry site EGFP (GFP only) were used to generate high-titer helper-free retrovirus supernatants following transient cotransfection of 293T cells. 293T cells were grown in 10-cm2 tissue culture treated plates (Becton Dickinson) precoated with poly-l-lysine (Sigma-Aldrich) in IMDM (Mediatech, Manassas, VA) supplemented with 10% heat-inactivated FCS (HyClone, Logan, UT), 1 mM l-glutamine, 100 U/ml streptomycin, and 100 μg/ml penicillin (complete IMDM; all from Life Technologies, St. Louis, MO). 293T transfections were performed by coprecipitating 15 μg retroviral vector with 15 μg ecotropic packaging vector using the CalPhos mammalian transfection kit (BD Biosciences, San Jose, CA). Medium was replaced every 12 h for 3 d with complete IMDM. Viral stocks were prepared by pooling supernatants collected at 36 and 48 h after transfection. Viral titers were determined following infection of 3T3 cells with serial dilutions of the pooled virus supernatant and found to range between 2 × 106 and 7 × 106 virus particles/ml. B-1 and B-2 progenitors were plated in 3 ml RPMI 1640 medium supplemented with 10% heat-inactivated FCS, 1 mM l-glutamine, 100 U/ml streptomycin, 100 μg/ml penicillin, 50 μM 2-ME, 50 μg/ml gentamicin, stem cell factor (20 ng/ml), IL-3 (20 ng/ml), Flt-3L (10 ng/ml), IL-7 (30 ng/ml; all from Life Technologies), and 4 μg/ml polybrene. Transwell inserts (0.4 μm) preseeded with confluent layers of the S17 stromal cell line were inserted into each well. GFP only or BCR-ABL/GFP retrovirus supernatants were added to the bottom wells containing the purified progenitor populations at t = 0, 4, 16, and 20 h of culture. After a total of 24 h in culture at 37°C, 5% CO2/air humidified incubator, the cells were harvested and viable cell counts were determined by eosin dye exclusion. Transduced SW cells were injected i.v. into SCID mice whereas RAG mice were used as recipients of transduced cells from B6, CRLF2−/−, and IL-7Rα−/− donors. The number of transduced cells injected is indicated in the figure legends. SCID and RAG recipients were conditioned with 300 or 550 rad, respectively, from a 137Cs irradiator (120 rad/min; Mark I-68A; J.L. Shepherd and Associates, San Fernando, CA) 12–24 h prior to injection of cells. Recipients were sacrificed when they became moribund. Their tissues were tested for the presence of donor-derived B-ALL tumor cells through coexpression of GFP and B lineage cell surface Ags as described above. Flash-frozen aliquots of purified cells were processed for gene expression by quantitative PCR. Total RNA was extracted with the RNeasy Plus micro kit and used to synthetize cDNA with the RT2 First Strand kit (both from Qiagen, Valencia, CA) as per the manufacturer’s instructions. Reactions were run in 25-μl volumes with SYBR Green quantitative PCR master mix (Bio-Rad) as recommended by the manufacturer. Amplification efficiencies were routinely found to be between 95 and 105%, and all reactions were run in duplicate. RT2 primer sets for p19 Arf, whose sequences were 5′-GCTCTGGCTTTCGTGAACATG-3′ (forward) and 5′-TCGAATCTGCACCGTAGTTGAG-3′ (reverse), and Gapdh (catalog no. PPM02946A) were purchased from SABiosciences. Presence of single PCR products was confirmed by melt curve analysis. Data were analyzed with Bio-Rad IQ5 software using the Pfaffl method with Gapdh as a reference gene. Gene expression in tumor cells harvested from mice was analyzed using a custom RT2 PCR array designed by Qiagen (Germantown, MD; no. CAPM11051) as per the manufacturer’s instructions. Expression of the following genes was examined: Jak1, Jak2, Stat1, Stat3, Stat5a, Stat5b, Akt1, Mcl1, and Grb2. The 2−ΔCt values for the custom array were calculated using the Pfaffl method with the means of the Ct values for Actb and Hsp90ab1 housekeeping genes as reference. Quality control for the custom array quantitative PCR reactions and gene expression analyses were performed on the Qiagen PCR array data analysis Web portal (http://pcrdataanalysis.sabiosciences.com/pcr/arrayanalysis.php?target= upload). Data are expressed as means ± SEM. Statistical significance for the differences between groups was determined by a two-tailed, unpaired Student t test (α = 0.05). The log-rank (Mantel–Cox) test was used to assess differences in the rate of ALL development between different groups of mice. B-1 and B-2 progenitors can be resolved based on their Lin−CD93+CD45Rlow/−CD19+ (6) and Lin−CD45R+CD93+CD19−CD43+ phenotypes (7), respectively (Supplemental Fig. 1), and they have been shown to differentiate into mature B-1 and B-2 cells following transplantation into immunodeficient recipients (6) (Supplemental Fig. 2). Because progenitors for these two B cell lineages arise in overlapping waves of development (3, 6), we were able to isolate both populations from the same bone marrow samples from SW mice, although in initial experiments we also purified B-1 progenitors from day 15 gestation fetal liver. Purified populations were transduced for 24 h in vitro with retroviral vectors containing BCR-ABL/GFP or GFP only. Cells were then harvested, washed, and transplanted i.v. into immunodeficient recipients. BCR-ABL was used in this study because we previously demonstrated its potential to transform B-2 pro–B cells (22), thus providing a reproducible model system to examine the leukemogenic potential of B lineage progenitors. Several mice that received BCR-ABL/GFP–transduced B-1 progenitors derived from fetal liver or young adult bone marrow became moribund as early as 18 d later, and by 40 d all recipients had to be sacrificed due to severe wasting symptoms. BCR-ABL/GFP–transduced B-1 progenitors from fetal liver or young adult bone marrow initiated B-ALL with similar kinetics (Fig. 1A). 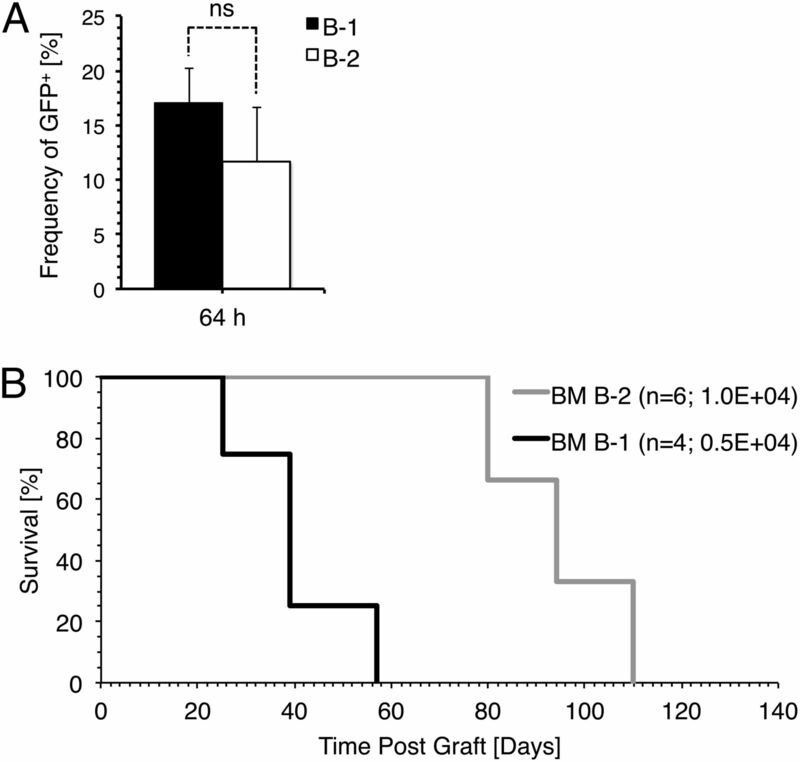 In contrast, recipients of BCR-ABL/GFP–transduced B-2 progenitors first showed signs of disease at around day 30 after transplantation, and many mice survived past 60 d (Fig. 1A). BCR-ABL–transduced B-1 progenitors induce rapid and severe B-ALL. (A) Survival curves for recipients of BCR-ABL–transduced B-1 progenitors from fetal liver (FL) or young adult bone marrow (BM) and B-2 progenitors from young adult bone marrow. Cells were harvested from SW mice (n indicates number of recipients). Numbers of transduced cells injected per mouse are indicated in parentheses. The solid line indicates that mice received 30,000 (3E+04) B-1 progenitors and the dashed line indicates that mice received 43,000 (4.3E+04) progenitors. Log-rank (Mantel–Cox) test results for differences in survival between groups were as follows: bone marrow B-2 (3E+04) versus bone marrow B-1 (3E+04), p = 0.002; bone marrow B-2 (3E+04) versus bone marrow B-1 (4.3E+04), p = 0.022; bone marrow B-2 (3E+04) versus fetal liver B-1 (3E+04), p = 0.07. Recipients of B-1 and B-2 progenitors transduced with GFP only–containing retroviruses never developed disease (data not shown). (B) Tumor burden in the bone marrow and spleen of recipients of BCR-ABL–transduced B-1 and B-2 progenitors purified from the BM and/or FL of SW mice. Means ± SEM and p values are shown. Each symbol represents an individual mouse. (C) Representative FACS plots showing the phenotype of tumor cells derived from BCR-ABL–transduced B-1 and B-2 progenitors. BCR-ABL–expressing cells, identified by their expression of GFP, were examined by FACS for expression of CD19, CD45R (B220), and sIgM. The tumor burden in recipient mice, assessed by quantifying the number of GFP+ cells, was nearly 2-fold higher in the spleen of mice that received transformed B-1 compared with B-2 progenitors (Fig. 1B). Regardless of whether they were derived from B-1 or B-2 progenitors, >95% of the tumor cells in the mice were CD19+CD45R (B220)+ surface IgM (sIgM)– pro/pre–B cells (Fig. 1C, Supplemental Fig. 3). The above results show that recipients of 3 × 104 B-1 progenitors developed disease more rapidly than did recipients of a comparable number of BCR-ABL–transduced B-2 progenitors. However, it was critical to determine whether the mice received a similar number of transduced cells. Although the BCR-ABL–containing retroviral construct contained a GFP reporter gene, its expression was inefficient at 24 h following transduction when cells were injected into animals. We thus cultured cell aliquots for 64 h and then measured GFP expression in the transduced B-1 and B-2 progenitors. As shown in Fig. 2A, there was no significant difference in their level of GFP expression, making it unlikely that differences in the number of transduced cells injected accounted for the more rapid development of B-1 progenitor ALL. This was further confirmed by comparing the kinetics of B-ALL development in recipients following injection of twice as many BCR-ABL/GFP–transduced B-2 than B-1 progenitors. As shown in Fig. 2B, recipients of 5 × 103 BCR-ABL/GFP–transduced B-1 progenitors still developed disease more rapidly than did recipients of 1 × 104 BCR-ABL/GFP–transduced B-2 cells. This result indicates that, within the range of cell doses tested, the latency in B-ALL emergence was linked to the lineage and not the number of transduced cells transplanted. B-1 and B-2 progenitors are transduced with comparable efficiency. (A) Frequency of GFP+ cells in aliquots of the BCR-ABL–transduced cells used for the in vivo injections following 64 h in culture. (B) Survival curves for recipients of 5000 BCR-ABL–transduced B-1 progenitors and 10,000 BCR-ABL–transduced B-2 progenitors (n indicates number of recipients). Log-rank (Mantel–Cox) test results for differences in survival between groups for bone marrow B-2 versus bone marrow B-1, p = 0.0005. B-1 progenitors proliferate vigorously in response to IL-7 (Table I) and are distinguished from B-2 progenitors by their TSLP responsiveness (6). To determine whether TSLP and IL-7 responsiveness were necessary for the development of B-1 progenitor ALL, we tested whether B-1 progenitors isolated from CRLF2−/− mice, which do not express the TSLP receptor, and IL-7Rα−/− mice can initiate disease following transduction with BCR-ABL. B-1 progenitors were easily detected in CRLF2−/− mice, indicating that signaling through the TSLP receptor is not required for their formation and/or maintenance (Fig. 3A). B-1 progenitors are also present in IL-7Rα−/− mice, albeit in reduced numbers, indicating that IL-7 signaling is required for their emergence in normal numbers (Fig. 3B). 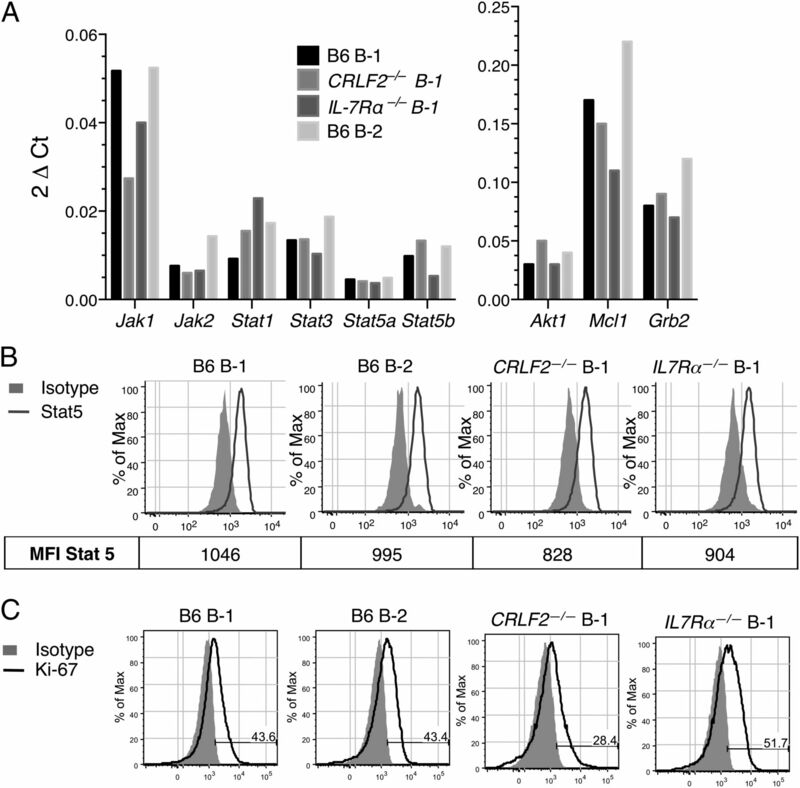 Deletion of CRLF2−/− and IL-7Rα−/− does not affect the development of B-ALL from BCR-ABL–transduced B-1 progenitors. (A) Purification strategy used to isolate B-1 and B-2 progenitors from the bone marrow of CRLF2−/− mice. The means ± SD frequency of B-1 progenitors is indicated. (B) Purification strategy used to isolate B-1 progenitors from the bone marrow of IL-7Rα−/− mice. The means ± SD frequency of B-1 progenitors is indicated. (C) Survival curves for recipients of BCR-ABL–transduced B6, CRLF2−/−, and IL-7Rα−/− B-1 and B-2 progenitors (n indicates number of recipients). The number of transduced cells injected per mouse is indicated in parentheses. Owing to the difficulty in isolating enough CRLF2−/− and IL-7Rα−/− B-2 progenitors, these populations were not tested in these experiments. (D) FACS plots showing the frequency of GFP+ cells in aliquots of the BCR-ABL–transduced B-1 and B-2 progenitors following 72 h in culture. The frequencies of GFP+ cells are indicated. (E) Representative FACS plots showing the phenotype of tumor cells derived from BCR-ABL–transduced CRLF2−/− and IL-7Rα−/− B-1 progenitors. GFP+ cells were examined by FACS for expression of CD19, CD45R (B220), and sIgM. Because CRLF2−/− and IL-7Rα−/− mice are on a B6 background, we first established that B-ALL also developed in that strain. Recipients of 1 × 104 BCR-ABL–transduced B6 B-1 progenitors efficiently initiated leukemia, and all mice had succumbed by day 45 thereafter (Fig. 3C). In contrast, the kinetics with which disease initiated in recipients of BCR-ABL–transduced B6 B-2 progenitors were delayed. In fact, some mice had not developed leukemia by 100 d following receipt of transduced cells. This was the case even though the efficiency with which the two B6 progenitor populations were transduced was comparable (Fig. 3D) and a higher number of transduced B-2 progenitors was injected into recipients (Fig. 3C). We then assessed whether BCR-ABL–transduced CRLF2−/− and IL-7Rα−/− B-1 progenitors could initiate disease and found that they could do so. In this case, the kinetics with which B6, CRLF2−/−, and IL-7Rα−/− B-1 progenitors developed disease were similar (Fig. 3C). As with SW progenitors, recipients of the BCR-ABL–transduced B6, CRLF2−/−, and IL-7Rα−/− B-1 progenitors developed tumors in their bone marrow and spleen (data not shown) that were primarily CD45R (B220)+sIgM— (Fig. 3E). Taken together, these data indicate that the initiation and progression of B-1 progenitor B-ALL is not dependent on signaling through the TSLP or IL-7 receptor. Because deletion of IL-7Ra abrogates both IL-7 and TSLP signaling, these data further indicate that B-1 progenitors can initiate B-ALL even when both pathways are simultaneously disabled. Even though the latency periods with which B-1 and B-2 progenitor ALL developed were distinct, once mice exhibited disease symptoms, their clinical course was indistinguishable and they rapidly succumbed within a week (data not shown). These observations suggested that the properties of established ALL tumor cells were similar, regardless of their B-1 or B-2 progenitor origin. We initially compared the expression of selected genes, which included Jak1, Jak2, Stat1, Stat3, Stat5a, Stat5b, Akt1, Mcl1, and Grb2, in the BCR-ABL signaling pathway in tumor cells. Mice received BCR-ABL–transduced B-1 and/or B-2 progenitors from B6, CRLF2−/−, and IL-7Rα−/− donors, and GFP+ tumor cells were harvested from animals when they became moribund. These genes were generally expressed at similar levels in the tumors regardless of lineage or strain of origin (Fig. 4A). B-1 and B-2 progenitor tumors exhibit similar properties. (A) Relative expression of genes involved in BCR-ABL signaling in tumor cells isolated from the spleen of mice that received BCR-ABL–transduced progenitors from B6, IL-7Rα−/−, and CRLF2−/− mice. The 2−ΔCt values were calculated using the Pfaffl method with the Ct means of Actb and Hsp90ab1 housekeeping genes as reference for the indicated genes. All reactions were run in duplicate. (B) Stat5 activation status in B6, CRFL2−/−, and IL-7Rα−/− B-1 and B-2 tumor cells as determined by phospho-flow analysis. (C) Frequency of Ki-67+ expression in the B6, CRFL2−/−, and IL-7Rα−/− B-1– and B6 B-2–derived ALL tumor cells described in (A). Activation of JAK/STAT signaling is commonly observed in BCR-ABL–transformed cells (23–25), so we next compared the activation of this pathway in B-1 and B-2 progenitor tumors. We isolated BCR-ABL–expressing (i.e., GFP+) tumor cells from the spleen of mice that had received an injection of transduced B-1 and B-2 progenitors and examined Stat5 levels by phospho-flow analysis. As shown in Fig. 4B, levels were indistinguishable between the GFP-expressing tumor cells isolated from wild-type, CRLF2−/−, and IL-7Rα−/− mice. We also observed that the various tumor cells exhibited similar levels of proliferation as measured by Ki-67 (Fig. 4C). The above results indicate that established B-1 and B-2 progenitor tumors are similar in terms of phenotype, gene expression, Stat5 activation, and proliferation. These observations suggest that events leading up to tumor formation, rather than the properties of ALL tumor cells, underlie the rapid development of B-1 progenitor ALL. To test this hypothesis, we assessed how the two progenitor populations responded to oncogene expression by transducing them with BCR-ABL, placing them in culture under B lymphopoietic conditions, and comparing their growth and survival 64 h later. The number of cells present in cultures seeded with BCR-ABL/GFP– or GFP only–transduced B-1 progenitors was higher than in those initiated with similarly transduced B-2 progenitors (Fig. 5A). This result likely reflects the higher proliferative potential of B-1 progenitors compared with B-2 progenitors, irrespective of transduction (Table I). Additionally, the distinct response of B-1 and B-2 progenitors to oncogene expression also affects cell recovery in the cultures. We used annexin V labeling to assess apoptosis in B-1 and B-2 progenitors. Whereas BCR-expressing B lineage cells that bind annexin V at low/intermediate levels may not be apoptotic (26), some cells that bind high levels of annexin V (annexin V+/high) are undergoing cell death (27). We found that very few B-1 and B-2 progenitors bind annexin V, and those that do are annexin V+/high (Supplemental Fig. 4). Taken together, these observations indicate that annexin V+/high binding can be used as a marker for apoptosis in these B cell progenitors. BCR-ABL–transduced B-1 progenitors exhibit enhanced survival compared to B-2 progenitors. (A) Number of GFP+ cells recovered from cultures established with GFP only– and BCR-ABL/GFP–transduced B-1 and B-2 progenitors. Cells were isolated from SW bone marrow, transduced with BCR-ABL/GFP or GFP-only vectors and analyzed following 64 h in culture. Results show the means ± SEM of four independent experiments. (B) Total number and (C) frequency of GFP+annexin V+/highPI+ and GFP+annexin V+/high PI− cells in cultures established with GFP only– and BCR-ABL/GFP–transduced B-1 and B-2 progenitors isolated from SW bone marrow following 64 h in culture. Results show the means ± SEM of two independent experiments. (D) Relative expression of p19Arf in nontransduced, BCR-ABL/GFP–transduced, and GFP only–transduced B-1 and B-2 progenitors. (E) Relative levels of p19Arf expression in B-1 and B-2 progenitors 72 h following transduction. Data represent the ratio of 2−ΔCt p19Arf values in BCR-ABL/GFP−transduced cells divided by the 2−ΔCt p19Arf values in GFP only−transduced cells for each progenitor population. The 2−ΔCt values were calculated using the Pfaffl method using Gapdh as a reference gene. The data are based on two independent experiments. Whereas transduction with the GFP-only vector induced cell death in both progenitor populations, the frequency and number of GFP+annexin V+/high and/or PI+ apoptotic cells were highest in cultures established with BCR-ABL–transduced B-2 progenitors (Fig. 5B, 5C). That cell death occurred following BCR-ABL expression is not unexpected, because this event is known to trigger an apoptotic response in B cell progenitors (28). However, the higher number of apoptotic cells in the cultures initiated with BCR-ABL–transduced B-2 progenitors suggests that they are more sensitive to oncogene expression. To define a genetic basis for the latter hypothesis, we examined expression of the p19Arf tumor suppressor gene in nontransduced, GFP only–transduced, and BCR-ABL/GFP–transduced B-1 and B-2 progenitors. The expression of p19Arf in B cell progenitors is known to trigger apoptosis through induction of p53 (28). p19Arf was expressed in unmanipulated B-1 progenitors and its levels did not significantly change following transduction with GFP or BCR-ABL. In contrast, p19Arf was not detected in unmanipulated B-2 progenitors, but expression was induced following BCR-ABL expression. This induction was not due to the transduction process alone, as p19Arf levels were higher in the oncogene-transduced compared with the GFP only–transduced cells (Fig. 5D). These differences in the response of B-1 and B-2 progenitors to BCR-ABL expression are particularly well illustrated when the relative level at which p19Arf is induced is compared (Fig. 5E). The data in this study demonstrate that B-1 progenitors can be B-ALL cells of origin and that, compared with B-2 progenitors, they initiate an aggressive form of the disease characterized by rapid onset and high tumor burden. These results provide a new conceptual framework for viewing the origins of infant and childhood B-ALL. Whereas most focus has been placed on the specific chromosomal translocation and/or secondary mutations as key events in leukemia initiation and progression, our data indicate that B cell lineage may also be a significant factor. Specifically, our results indicate that intrinsic differences between B-1 and B-2 progenitors exist and influence their response to BCR-ABL expression. These results reinforce the concept that the cellular landscape in which oncogene expression occurs is an important determinant for ALL development. In this regard, we recently demonstrated that the potential of BCR-ABL to transform young and old pro–B cells was distinctly different because of differences in patterns of gene expression between these progenitors (29). A key finding of this study was that the kinetics with which B-1 and B-2 progenitor ALL developed were significantly different. This result was not related to the number of transduced cells introduced into the recipients, because B-1 and B-2 progenitors were transduced with similar efficiency. We considered the possibility that TSLP responsiveness was responsible for the aggressive nature of B-1 progenitor ALL, because B-1, but not B-2, progenitors are TSLP responsive (6, 9) and CRLF2 expression has been associated with poor ALL outcome (17, 30, 31). Our data showing that CRLF2-deficient B-1 progenitors still initiated rapid ALL suggest that TSLP responsiveness was not critical for the initiation of B-1 progenitor ALL. This was further confirmed by the observation that abrogation of IL-7Rα expression, which results in disruption of TSLP and IL-7 signaling, did not affect the initiation of B-1 progenitor ALL. Examination of established B-1 and B-2 progenitor tumors did not provide insights into why B-1 progenitor ALL developed so rapidly. Tumor cells, regardless of whether they were derived from wild-type, CRLF2−/−, and/or IL-7Rα−/− mice, were homogeneous in terms of phenotype, gene expression, Stat5 activation, and proliferation. These results led us to consider that the initial response of B-1 and B-2 progenitors to oncogene expression might be distinct, and this was what was observed. The number of cells recovered from cultures initiated with BCR-ABL–transduced B-1 progenitors was higher than in cultures initiated with BCR-ABL–transduced B-2 progenitors. One reason for this is that the oncogene-expressing B-1 progenitors exhibited lower levels of apoptosis compared with B-2 progenitors, which correlated with the differential response of these progenitors to p19Arf expression. Unmanipulated B-1 progenitors appear to tolerate low levels of p19Arf, and BCR-ABL expression did not induce it to higher levels. In contrast, unmanipulated B-2 progenitors did not express p19Arf, but it was induced in these cells following oncogene expression. Based on these observations, we propose that the high levels of apoptosis in BCR-ABL–expressing B-2 progenitors result from their relative sensitivity to p19Arf. Additionally, it is likely that the increased proliferative potential of B-1 progenitors, which distinguishes them from B-2 progenitors, further contributes to the increased number of cells harvested from the cultures initiated with the former cells. Taken together, these results highlight distinctions in how these two B cell progenitor populations respond to oncogene expression. These observations allow us to propose a model for what occurs when BCR-ABL is expressed in B-1 progenitors in vivo. Because of their high proliferative potential and relative resistance to oncogene-induced death, a significant cohort of oncogene-expressing B-1 progenitors poised to generate ALL would build in the individual. These cells may in turn be exposed to microenvironmental factors that further promote their survival and/or expansion. For example, even though IL-7 and TSLP responsiveness are not required for the development of B-1 progenitor ALL, the differential responsiveness of B-1 progenitors to these cytokines could still be a factor in the proliferation and/or survival of BCR-ABL–expressing cells. The presence of a high number of BCR-ABL–expressing B-1 progenitors may in turn increase the probability that these cells cross the threshold from BCR-ABL expression to ALL initiation. In contrast, the lower resistance B-2 progenitors to oncogenic stress would result in a smaller pool of oncogene-expressing cells in the individual. In some cases, all oncogene-expressing B-2 progenitors may be eliminated, which would explain why some recipients of BCR-ABL–transduced B-2 progenitors never developed leukemia. We cannot exclude the additional possibility that oncogene-expressing B-1 progenitors are more prone to acquire key secondary mutations that further drive disease (17), but more extensive genetic profiling will be necessary to assess this possibility. The results in this study, which provide a developmental view of the origins of B-ALL, suggest that some aggressive forms of the disease may be malignancies of B-1 progenitors. This view allows clinical observations to be viewed from a new perspective. For example, one study stratified pediatric with Philadelphia+ chromosome B-ALL patients into three groups based on leukocyte counts at the time of diagnosis and response to chemotherapy. The estimates of 5-y disease-free survival for these patients ranged from 49% for those with the lowest leukocyte counts to only 20% for those with the highest number (15). It is tempting to speculate based on the present data that B-1 progenitors were transformed in the patients with the highest lymphocyte counts. B-1 B cells have been described in nonhuman primates (32) and humans (33). It will be interesting, once human B-1 progenitors are resolved, to determine whether their response to oncogene expression differs from that of B-2 progenitors. This work was supported by National Institutes of Health Grants AI021256 and CA173028. Flow cytometry was performed in the Jonsson Comprehensive Cancer Center Core (supported by National Institutes of Health Grants CA16042 and AI28697) and the Broad Stem Cell Research Center Core at the University of California, Los Angeles.
. 1974. In vitro generation of B lymphocytes in mouse foetal liver, a mammalian “bursa equivalent”. Nature 249: 361–363.
. 1976. Studies on the generation of B lymphocytes in the mouse embryo. Eur. J. Immunol. 5: 468–473.
. 2007. The protean nature of cells in the B lymphocyte lineage. Immunity 26: 703–714.
. 2001. Bipotential B-macrophage progenitors are present in adult bone marrow. Nat. Immunol. 2: 83–88.
. 2007. Reply to “TSLP mediated fetal B lymphopoiesis?”. Nat. Immunol. 8: 898.
. 2004. Pre-B cell receptor expression is necessary for thymic stromal lymphopoietin responsiveness in the bone marrow but not in the liver environment. Proc. Natl. Acad. Sci. USA 101: 11070–11075.
. 2008. Acute lymphoblastic leukaemia. Lancet 371: 1030–1043.
. 2009. Molecular genetics of acute lymphoblastic leukemia. Annu. Rev. Pathol. 4: 175–198.
. 2010. Prognostic effect of chromosomal abnormalities in childhood B-cell precursor acute lymphoblastic leukaemia: results from the UK Medical Research Council ALL97/99 randomised trial. Lancet Oncol. 11: 429–438.
. 2000. Outcome of treatment in children with Philadelphia chromosome-positive acute lymphoblastic leukemia. N. Engl. J. Med. 342: 998–1006.
. 2006. Biologic pathways associated with relapse in childhood acute lymphoblastic leukemia: a Children’s Oncology Group study. Blood 108: 711–717. 2012. Molecular genetics of B-precursor acute lymphoblastic leukemia. J. Clin. Invest. 122: 3407–3415.
. 1987. Clinical and biologic hallmarks of the Philadelphia chromosome in childhood acute lymphoblastic leukemia. Blood 70: 948–953.
. 2011. Developmental origins and impact of BCR-ABL1 fusion and IKZF1 deletions in monozygotic twins with Ph+ acute lymphoblastic leukemia. Blood 118: 5559–5564.
. 2003. Origins of chromosome translocations in childhood leukaemia. Nat. Rev. Cancer 3: 639–649.
. 2004. Absence of an essential role for thymic stromal lymphopoietin receptor in murine B-cell development. Mol. Cell. Biol. 24: 2584–2592.
. 2010. Immature B-cell progenitors survive oncogenic stress and efficiently initiate Ph+ B-acute lymphoblastic leukemia. Blood 116: 2522–2530.
. 2003. In BCR-ABL-positive cells, STAT-5 tyrosine-phosphorylation integrates signals induced by imatinib mesylate and Ara-C. Leukemia 17: 999–1009.
. 2004. JAK/STAT, Raf/MEK/ERK, PI3K/Akt and BCR-ABL in cell cycle progression and leukemogenesis. Leukemia 18: 189–218.
. 1996. Constitutive activation of STAT5 by the BCR-ABL oncogene in chronic myelogenous leukemia. Oncogene 13: 247–254.
. 2001. Annexin V binds to positively selected B cells. J. Immunol. 166: 58–71.
. 2000. Annexin V binds to viable B cells and colocalizes with a marker of lipid rafts upon B cell receptor activation. J. Immunol. 164: 1322–1332.
. 2008. The INK4-ARF (CDKN2A/B) locus in hematopoiesis and BCR-ABL-induced leukemias. Cold Spring Harb. Symp. Quant. Biol. 73: 461–467.
. 2008. Aging and cancer resistance in lymphoid progenitors are linked processes conferred by p16Ink4a and Arf. Genes Dev. 22: 3115–3120.
. 2012. Outcome modeling with CRLF2, IKZF1, JAK, and minimal residual disease in pediatric acute lymphoblastic leukemia: a Children’s Oncology Group study. Blood 119: 3512–3522.
. 2012. Aberrant STAT5 and PI3K/mTOR pathway signaling occurs in human CRLF2-rearranged B-precursor acute lymphoblastic leukemia. Blood 120: 833–842.
. 2013. Primate B-1 cells generate antigen-specific B cell responses to T cell-independent type 2 antigens. J. Immunol. 190: 3100–3108.
. 2011. Human B1 cells in umbilical cord and adult peripheral blood express the novel phenotype CD20+ CD27+ CD43+ CD70−. J. Exp. Med. 208: 67–80.